In the guest book Have your say! My wife anu and I worked with Afromaxx twice. Once for a safari and tanzania and once for a 10 days trip in uganda. they do a great job with organizing. They have great staff, good jeeps and are super flexible with respect to itineraries. Thanks again Rainer. I’m coming to Tanzania this August with my girlfriend. 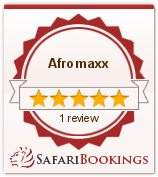 We are looking for having a great time and do a Safari. So we want to ask, if you please could give us a price for 7 days Safari?